Chip-scale integrated optics and photonics: The focus of our research activity is in the area of integrated optics and photonics. Integrated optics involves the manipulation of light at the micrometer and nanometer scales. It is analogous to integrated electronics. 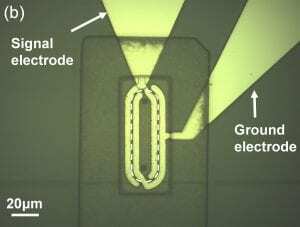 Instead of electrons, however, photons are guided and controlled on the surface of an optical chip. Thin-film technology is applied to realize optical circuits and devices for the purpose of achieving high-performance optical systems with advantages in efficiency, miniaturization, mechanical stability, and economies of scale. Our vision is to drive revolutionary innovation in sensors, communications systems, and computing by creating fundamental components that can be interconnected to implement entire optical systems on the chip-scale. Research investigations span concept development, design, modeling, simulation, fabrication, test, and measurement. 1. 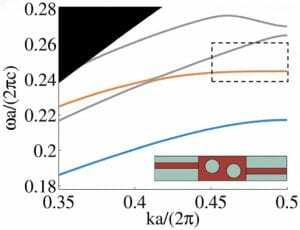 Voltage control of optical polarization: It is challenging to electrically manipulate the polarization state of light in planar optical waveguides. 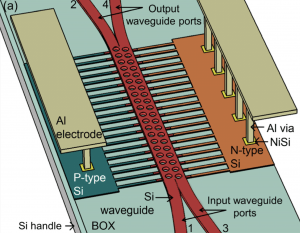 We are investigating out-of-plane optical waveguides, allowing access to Berry’s phase, a phenomenon of purely topological origin, in order to electrically tune optical polarization rotation. With this approach, devices fabricated in the silicon-on-insulator material platform are not limited to a single static polarization state. Rather, they can exhibit dynamic tuning of polarization from the fundamental transverse electric mode to the fundamental transverse magnetic mode. 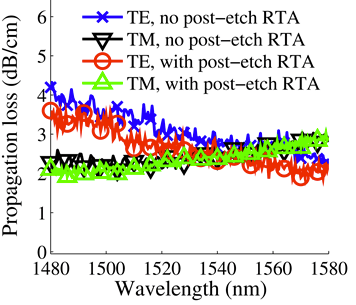 We have demonstrated electrical tuning of optical polarization over a 19 dB range of polarization extinction ratio with less than 1 dB of conversion loss at infrared wavelengths. 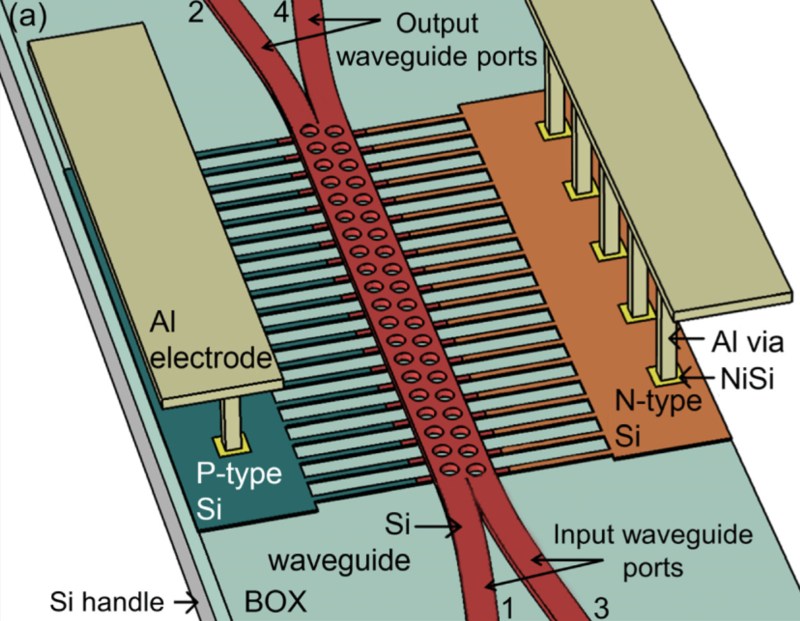 Compact system architectures involving dynamic control of optical polarization in integrated circuits are envisioned. 2. Nonlinear optics in thin films of lithium niobate: Bulk lithium niobate is a very successful ferroelectric crystal that is currently in use in modern telecommunications systems. Technological advances have been limited by the relatively low refractive index contrast provided by titanium diffused optical waveguides resulting in large optical structures with millimeter scale bend radii and low optical confinement. Therefore, we are investigating thin films of lithium niobate with thicknesses that are less than one micrometer. The films can be bonded to a lithium niobate wafer with an oxide buffer layer to produce lithium-niobate-on-insulator (LNOI), analogous to silicon-on-insulator (SOI). Just as SOI has been enabling for silicon integrated photonics, LNOI has the potential to be transformational for lithium niobate integrated photonics. Future optical systems can be realized on the chip-scale that harness efficient nonlinear optical functionalities such as second harmonic generation, difference frequency generation, sum frequency generation, and optical rectification. 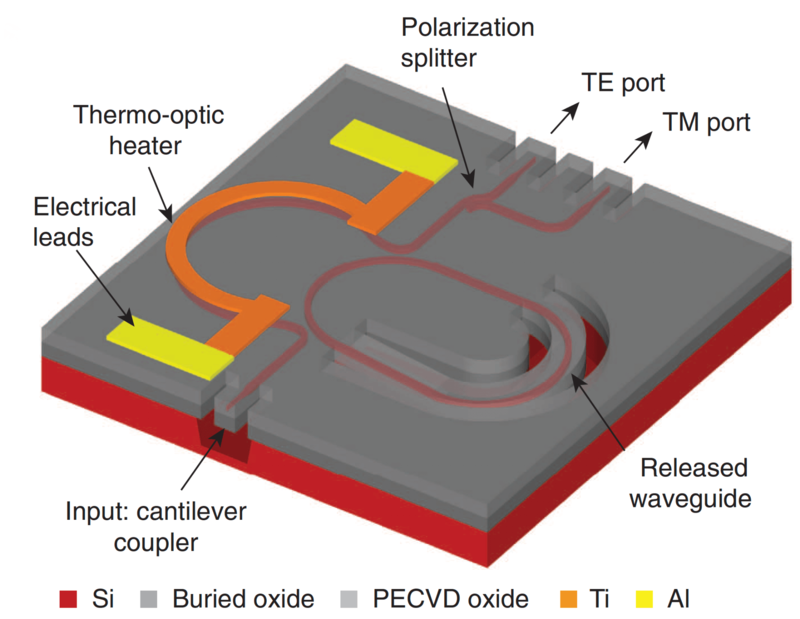 Furthermore, a hybrid material system consisting of both silicon and lithium niobate enables compact integrated optics on a silicon platform with electro-optic functionality provided by a true second order material susceptibility. This framework provides opportunities to access unique properties of hybrid materials and to explore their electrical-optical and all-optical interactions to advance and develop a new class of on-chip photonic devices and systems. Voltage controlled silicon microring resonators enable electrically tunable optical filters, switches, and modulators, as well as RF electric-field sensors in compact integrated photonics. Next generation system architectures involving the convergence of photonics with electronics in integrated circuits are envisioned. 3. Photonic crystal band edge resonators: Integrated photonics based on periodic structures harness the dispersion engineered properties of guided wave dielectric structures. 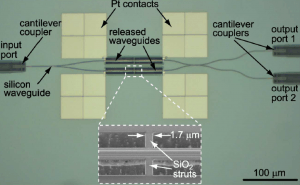 We are studying coupled periodic dielectric optical waveguides that can exhibit giant transmission “slow light” resonances at optical telecommunications wavelengths in the silicon-on-insulator material system. 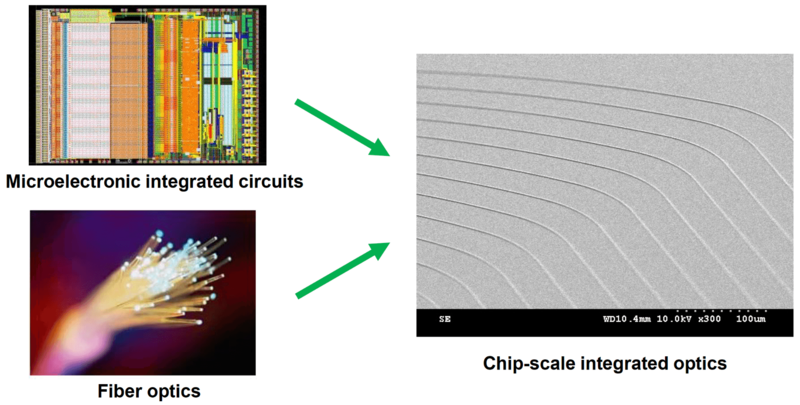 Novel chip-scale photonics are enabled for photon emission, propagation, amplification, storage, and material interaction. Experimentally, carrier injection devices have yielded large DC tunabilities of 7.1 nm/V and peak switching slope of 206 dB/V. Digital data transmission measurements at 100 Mb/s show 3 dB of switching with a swing voltage of 6.8 mV, 91.4 aJ/bit switching energy, and 1.08 pJ/bit holding energy. 4. 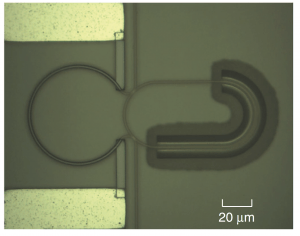 Fiber-to-chip coupling: Silicon photonics is a promising approach for chip-scale integrated optics, however, coupling light to submicrometer cross-section waveguides from an optical fiber is a major challenge. 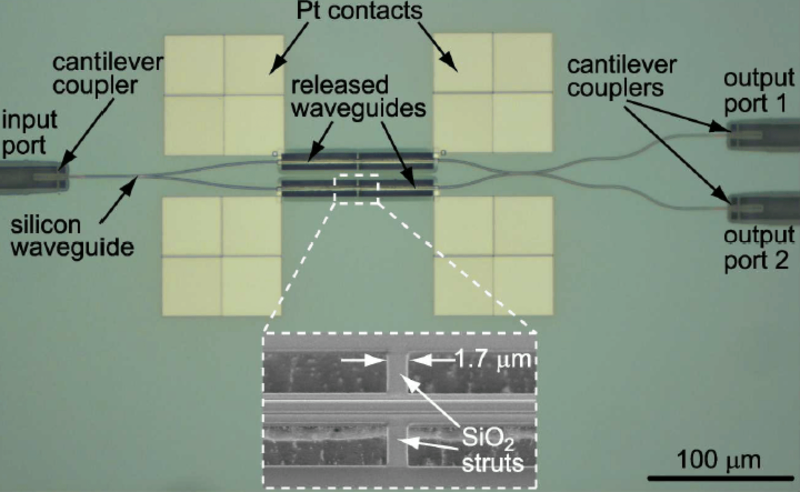 To solve this problem, we have created both fiber-to-chip and chip-to-chip light coupling structures employing cantilever couplers with inverse width tapers. Cantilever couplers enable broadband and low loss light coupling to photonic integrated circuits on an entire chip surface without the need for dicing or cleaving the chip. Our fabricated devices demonstrate average coupling losses of 0.62 dB per connection for the TE mode and 0.50 dB per connection for the TM mode across the optical telecommunications C band (1530 nm – 1565 nm). The length of only 7.5 μm yields the most compact fiber-to-strip waveguide coupler employing inverse width silicon tapers reported in the literature. 5. Fabrication technologies: Nanoscale fabrication technologies are critical for the realization of low loss and high performance silicon photonic integrated circuits. We have developed electron beam lithography fabrication techniques that yield silicon strip waveguides (450 nm × 250 nm cross-section) with RMS sidewall surface roughness of 2.1 nm with a correlation length of 94 nm. State of the art optical propagation losses have been achieved: 2.5 dB/cm for the TM mode and 2.8 dB/cm for the TE mode, over the entire telecommunications C-band. 6. Optical switching: Advances in optical switching technologies are essential for future high performance optical networks. We have achieved (record low) submilliwatt switching power and submillisecond switching time in Mach-Zehnder interferometer thermo-optic switches by employing free-standing silicon waveguides in 100 mm long interferometer arms. At 1550 nm wavelength, measurements of fabricated devices demonstrate a switching power of 540 mW, a 10% – 90% rise time of 141 ms, extinction ratio of 25 dB, and device insertion loss approximately equal to 2.8 dB. Applications include optical cross connect (OXC) and optical add-drop multiplexing (OADM) nodes. We have also applied free-standing silicon waveguides to ring resonators to achieve optical bistability in the range of tens of microwatts. 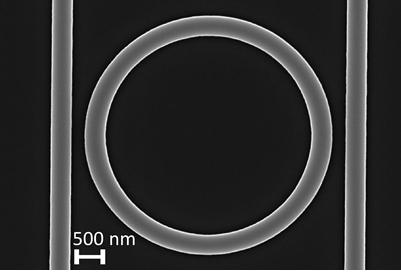 By etching an air gap between the ring resonator and the substrate, pump light induced heat is confined to a thermally isolated region around the core and contributes to the thermo-optic effect more efficiently. This work represents an enabling technology for ultracompact, extremely low power all-optical switching, and optical logical computing.